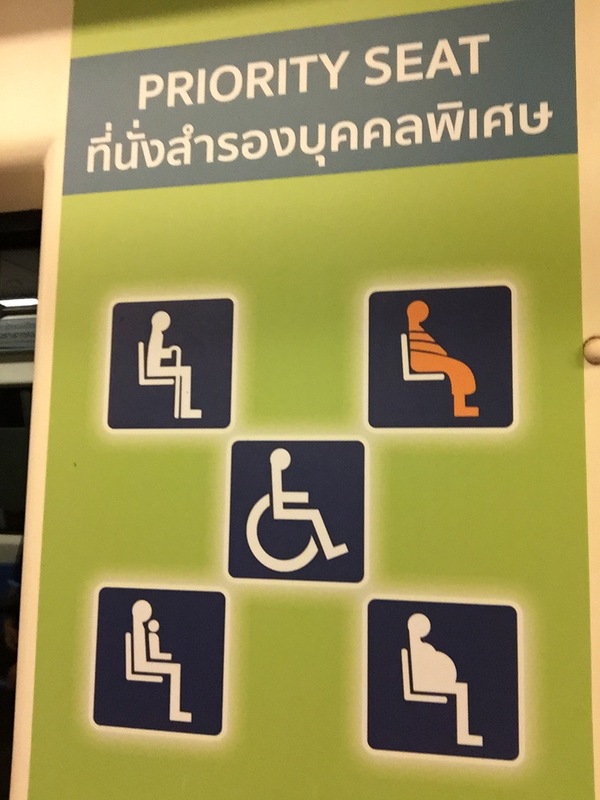 Signage in a city train. Can you guess what the orange one represents? A Buddhist monk. I don’t often see monks on public transport and have to confess I felt somewhat outraged when once a monk asked me to move for him. There was a vacant seat next to me but if he took it he would have had to sit between me and a woman. He made it clear to me he had no intention of sitting next to a woman! 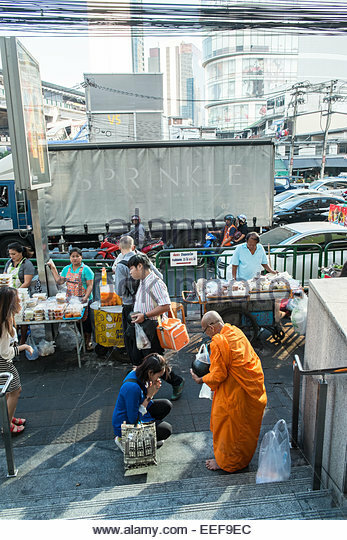 A more common scene in both streets, shopping complexes, work offices and factories, and in household properties, both inside and outside houses and units, are Buddhist shrines where regulars and passers-by will often be found stopping to pray and leave offerings. People do both in public quite unselfconsciously as if simply filling up at a petrol station or pausing to answer their cell phones. That photo reminds me of a scene I witnessed this morning. In a busy city street a man had stopped on his bicycle to call to a passing monk. After sorting out the various food items in his bike basket he gave most to the monk who then proceeded to pray for him. Both faced each other, hands held together in our familiar prayer gesture, while the monk prayed at some length. (He had been given a lot of food, after all.) They each then went on their way. 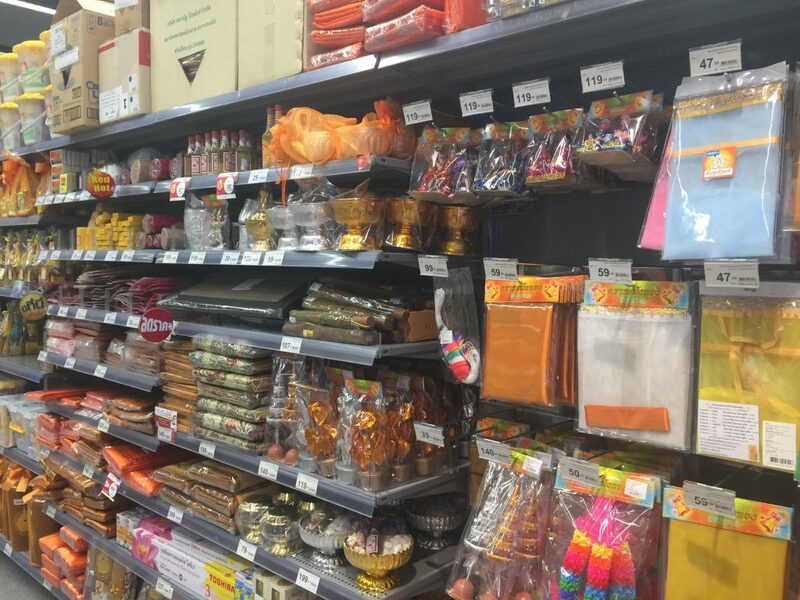 Here are the contents of one of many aisles in a large supermarket. Can you work out what they are? They are ceremonial items for one’s shrine at home or anywhere else where one wants to stop and pray and leave an offering. All part of the weekly grocery shopping list. 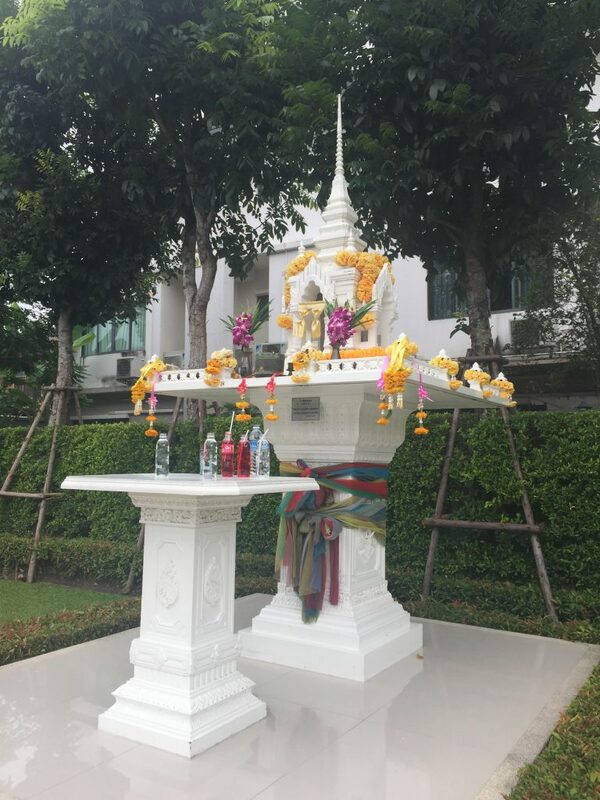 And here’s the shrine at the entrance to where I happen to be staying now: Those items on the front table are drinks, one an equivalent of a Thai coke with a straw in it. They are part of what have been left there by passers by stopping to kneel as they pray before moving on with their daily business. I find it difficult to dislike Buddhism because what I’ve been exposed to is on the whole so non-judgemental compared with Western Christianity. But it does consist of humans and as I think I mentioned previously there are massive public scandals about one outfit accused of all sorts of corruption. Nor do I ever know what to make of seeing monks in a goldsmith’s shop, as I sometimes do. And I cannot help but wonder if behind the public facade there are the same sorts of sexual abuse going on that have finally come to light among Western Christian churches.